VERY FINE AND CHOICE. A BEAUTIFUL EXAMPLE OF THE RARE 4-CENT COLUMBIAN ERROR OF COLOR. 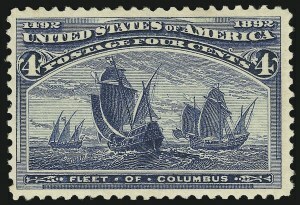 The 4c Columbian color error was caused by the use of a wrong batch of ink, and spectrographic analysis has shown that the blue inks of the 4c error and 1c Columbian have the same components. 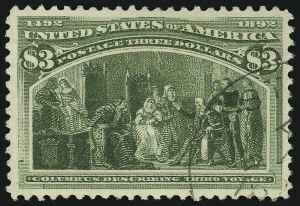 Stamps from at least two panes reached collectors, and the few cancelled examples indicate that stamps used by the public came from other panes. 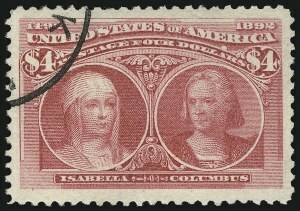 It is likely that a number of full sheets were printed using the wrong ink, and most of the stamps have simply been lost to philately. VERY FINE AND CHOICE. 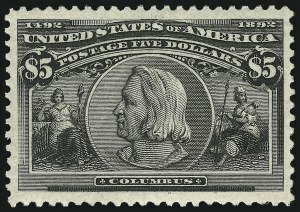 A BEAUTIFUL IMPRINT AND PLATE NUMBER STRIP OF FOUR OF THE 50-CENT COLUMBIAN ISSUE. 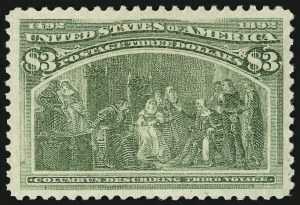 Scott Retail does not take the Mint N.H. stamp into account. Signed in pencil in selvage at bottom left. EXTREMELY FINE. A BEAUTIFUL MINT NEVER-HINGED EXAMPLE OF THE $1.00 COLUMBIAN. 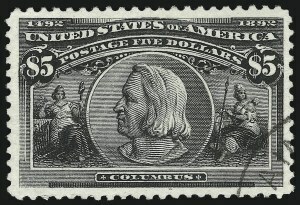 VERY FINE AND CHOICE MINT NEVER-HINGED EXAMPLE OF THE $4.00 COLUMBIAN. EXTREMELY FINE GEM. 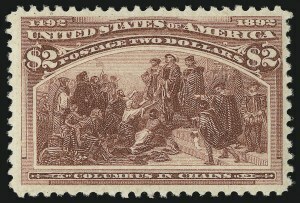 AN OUTSTANDING ORIGINAL-GUM EXAMPLE OF THE $3.00 COLUMBIAN. EXTREMELY FINE GEM. A BEAUTIFUL ORIGINAL-GUM $3.00 COLUMBIAN. EXTREMELY FINE GEM USED EXAMPLE OF THE $3.00 COLUMBIAN. EXTREMELY FINE GEM. 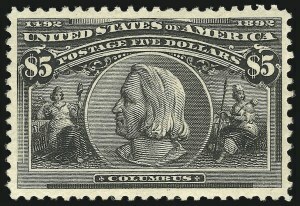 A HUGE BEAUTIFULLY CENTERED EXAMPLE OF THE $4.00 COLUMBIAN ISSUE. 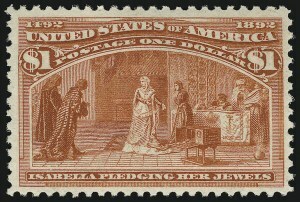 A TRUE CONDITION RARITY IN ALL FOUR C's -- COLOR, CENTERING, CANCEL AND CONDITION. EXTREMELY FINE GEM. 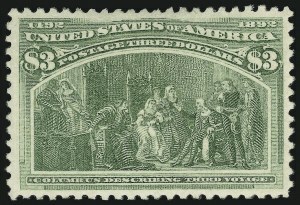 A SUPERB AND HUGE-MARGINED ORIGINAL-GUM EXAMPLE OF THE $5.00 COLUMBIAN. EXTREMELY FINE. A BEAUTIFUL EXAMPLE OF THE $5.00 COLUMBIAN. EXTREMELY FINE GEM. A REMARKABLE USED COPY OF THE $5.00 COLUMBIAN.